Get San Jose real estate market trends and updates from Realtors and real estate brokers in Santa Clara county in areas like: Saratoga, Los Gatos, Cupertino, Sunnyvale, Morgan Hill, Blossom Hill, Almaden Valley and many more Silicon Valley communities. The Sunnyvale real estate market, a significant portion of the Silicon Valley and Bay Area housing markets, saw mixed signals in the most recent tracking periods. The median price of a Sunnyvale home for sale increased substantially in the month of July, although home sales dipped somewhat. According to an August 11, 2010 report from the Mercury News, "The Bay Area's two biggest metro areas had two of the nation's three biggest housing price gains in the second quarter, the National Association of Realtors reported today. The median house price in the beautiful San Jose-Sunnyvale-Santa Clara metro area jumped 26 percent year over year to $630,000. In the San Francisco-Oakland-Fremont area, the median price climbed 25 percent to $591,200. (Only Akron, Ohio, oddly enough, had a bigger gain, at 36 percent.) Of course, prices in both the San Jose and San Francisco metro areas are still down sharply from the peak of the market. In 2007, for example, the median house price was $836,800 in the San Jose area (Santa Clara and San Benito counties) and $804,800 in the San Francisco area (which includes San Francisco, its relatively expensive suburbs in Marin and San Mateo counties, and more affordable -- at least by Bay Area standards -- communities in Alameda and Contra Costa counties)." The Sunnyvale housing market has faced something of a downturn recently, mostly as a result of the expiring federal housing tax credit. However, local experts were less concerned about the effects of the expiration in the Silicon Valley area. According to an August 9, 2010 report also from the Mercury News, "Yun expects mortgage interests to remain historically low for the rest of the year with "very modest growth" in employment. He described the lull in sales as an expected "pausing situation," and noted job creation is essential to boosting consumer confidence and home sales...Jeff Bell, president of the Silicon Valley Association of Realtors, stressed market conditions vary, depending on location. "We expected the sales pace to slow with the end of the federal homebuyer tax credit, but so far, the local picture appears healthy," Bell said. Bell indicated sales on the high-end market have picked up with lower mortgage interest rates and the loosening of the jumbo market...Bell also stressed job creation is key to a sustainable housing recovery." The Saratoga real estate market, found in the midst of Santa Clara County in the San Francisco Bay Area, saw a sharp rise in the rate of foreclosure as well as a steep drop-off in the number of home sales. This may partially be a result of the expiration of the federal housing tax credit, but the decline is still sharper than expected. According to an August 12, 2010 article from the San Jose Mercury News, "Foreclosures jumped in July in Santa Clara and San Mateo counties, mirroring a statewide trend, but the number was down from a year ago, according to a report released Thursday. Santa Clara County had 363 foreclosures, a 20 percent increase over June, but 12 percent below July 2009....There were 645 new notices of default in Santa Clara County and 236 in San Mateo County, drops of 10 percent and 25 percent, respectively. It is now taking almost two years on average for lenders to foreclose on a home after the borrower first misses a payment, said Sean O'Toole of ForeclosureRadar...The number of homes in "foreclosure limbo" -- in which a bank has filed a notice of sale but hasn't sold the home at auction -- continued to decline, down 7 percent in each county. But the number remains high -- 4,103 homes in Santa Clara County and 1,445 in San Mateo County." Fewer Saratoga homes for sale were purchased in the month of July, mirroring the trend of the Bay Area Peninsula. An August 18, 2010 article also from the Mercury News noted that "After steadily rising for several months, Peninsula home sales plummeted to near-historic lows in July as demand remained tepid and the federal homebuyer tax credits that had helped caffeinate the marketplace in the past year finally went away. San Mateo County saw 463 sales of single-family resale homes, the lowest for a July in 20 years. In Santa Clara County, the 1,159 single-family resale homes that closed escrow represented a drop of 24.3 percent from the 1,531 sold a year earlier, making this the second-slowest July since 1990, according to figures released Thursday by the real estate information service MDA DataQuick. And even though median prices rose in July from a year earlier, with a 7.2 percent rise in San Mateo County and an 8 percent increase in Santa Clara County, there are signs that recent home-price appreciation is losing steam." A neighborhood within the city of San Jose, California, Almaden Valley is home to about 37,000 residents and lies in San Jose's southwestern area. The area is just southeast of Los Gatos, and is considered to be part of the heart of the high-tech Silicon Valley, famed for its multitude of technology, research, venture-capital and scientific services firms. 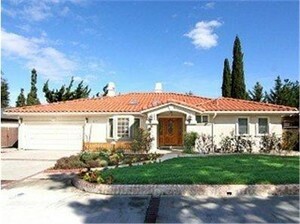 The Almaden Valley area is home mostly to modest houses and is a decidedly middle-class neighborhood. The area was recently affected by the downturn in the greater U.S. real estate market, especially in California, and as a result the past couple years have seen foreclosures in San Jose rise while home prices fell to the lowest levels in years. Recently, however, the Almaden Valley real estate market seems to be staging a comeback. According to MLS statistics, the median price for homes for sale in Almaden Valley in June, the most recent month for which statistics are available, was $875,000. That figure represents a 5.6% drop from May 2010 but it also accounts for 11.5% increase year-over-year; in June 2009 the median price was just $785,000. The average price was down on both counts, however. The average sales price in June was just under $913,500, down 2.8% from May and down a slight 1.2% from June 2009's figures. Sales volume in the valley fell by nearly half from the previous month in June. There were 29 homes sold, down from 54 homes sold in May. However, this figure remained unchanged from June 2009. The number of properties pending sale has remained nearly constant, with 45 in June, compared with 51 in May and 45 in June 2009. The inventory of Almaden Valley homes for sale has cleared out a bit since last year. During June, there were 108 properties listed for sale, an increase of 13.7% from May, but down 12.2% year-over-year; there were 123 homes listed for sale last year at the same time. The days homes spend on the market before selling has improved since May, when that figure was 44 days. In June, the figure was 34 days, though that is up slightly from June 2009's average of 31 days. As the third-largest city in California and one of the top 10 largest cities in America, San Jose, California, no doubt has a competitive and robust real estate market. The city, which is the county seat of Santa Clara County, is home to more than 964,000 residents and is the anchor city of the famed high-tech Silicon Valley area. The city's residents tend to be quite wealthy: In 2007, median annual household income was measured to be nearly $77,000, the highest level for an American city with more than 250,000 residents. This wealth tends to push up home prices, making San Jose real estate a coveted acquisition. Because demand and prices are high, the San Jose market was hit by the downturn in the greater U.S. real estate market, causing foreclosures in San Jose to rise and prices to fall. Lately, the market seems be finding its footing again, though. In June, the market for homes for sale in San Jose saw some mixed signals. The market for single-family homes saw new listings and inventory rise year-over-year as more homes flooded the market. According to the monthly statistics compiled by the Santa Clara County Association of Realtors, the inventory in June stood rtyhjjmmmat 2,525 versus 2,171 a year earlier. There were 1,029 new listings, compared with 866 in June 2009. Meanwhile, sales volume was down, with 588 homes sold in June versus 694 sales last year, as was the average number of days home spent on the market before selling, which stood at 56 days, down from 90 days one year ago. Both the median and average sales prices were up annually, though, a positive sign for homeowners wanting to sell their homes in the near future. The average sales price in was around $594,000, up from $503,660 a year ago; the median price stood at $523,500 in June, up from June 2009's clip of $449,000. The condo market saw similar trends in San Jose. New listings and total inventory both rose on an annual basis, from 303 to 347 and from 888 to 1,198, respectively. Sales rose slightly this June to 212 from 206, while the average number of days condos spent on the market before selling fell to 86 from 120. Prices for San Jose condos rose significantly year-over-year, an encouraging sign for sellers who have been waiting on the sidelines for prices to rise again before listing their properties. In June, the average sales price was around $323,800 up from around $285,125, while the median sales price was $307,500 up from $240,000. The next few months should be telling for the Los Altos real estate market, as a non-stimulus driven economy begins to fall into place. According to John Walsh, the president of MDA DataQuick, “The next few months should be very interesting. We're about to see how well the housing market can fly on its own. The tax credits no doubt stole some demand from the rest of this year, and soon we'll have a better sense of just how much. The Bay Area market is getting a boost from super-low mortgage rates and a slightly friendlier lending environment for high-end borrowers. But, barring new government stimulus, the housing market will be relying very heavily on improvements in the economy. A lot will depend on how many people find jobs, or stop worrying about losing the one they have."